Two years ago, when Google bought 5% of AOL, the agreement included "enabling Google Talk and AIM instant messaging users to communicate with each other, provided certain conditions are met". I really hope that they are planning on dressing up gTalk desktop. I have no interest in gTalk gadget or in using it in the inbox in Gmail. I do not leave my browser open all day but I do leave Pidgin open all day. If Google wants me to use gTalk then it has to be through the desktop application or I am fine sticking with Pidgin. Google add Gadu-gadu in future? Gadu-gadu is popular IM from Poland. Love the color scheme. Do you have more screenshots? 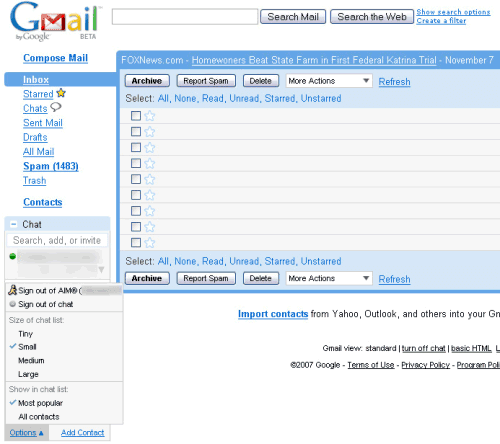 Too bad Gmail users still have to register an AIM ID. Do you know whether this works when signing in from another Jabber client too? Wow, bummer that it looks like they are using a transport rather than true AIM<->XMPP federation (i.e. you wouldn't need an AIM account). 100% you don't need a aim account. The same will be with the other IM protocols. This is gonna be great, i can't wait to get rid of jahoo (well, on ubunut/fedora~linux right now.. using pidgin, but the jahoo mail gets tons of spam... useless). Any chance Gtalk interops with MSN or Yahoo IM? When will this new interface be rolled out? Any1 with sources if with this feature will be able to contact ICQ or .MAC people, AIM can do it, so maybe Gtalk? I'll definitely use this when it is out. I keep a Gmail page open so much I almost wouldn't miss a specialized client program, but if Gtalk (with or without audio) for Linux was available and could interop with AIM I'd do that in a minute. Yes, it looks like a Jabber transport is being used. This is the easiest way for them to get it running, which is unfortunate, but given the way AIM's protocol works (it's VERY centered around screen names), the best way to go about it right now. Google Talk's servers already support registering with and using foreign transports if you connect with a Jabber client such as Psi -- I'm already using it with AIM, MSN/Live, and Yahoo without issues, though via other people's server transports. This just brings the AIM transport in-house at Google for a better integration with Gmail and the standalone Google Talk. As far as contacting mac.com and ICQ users, that should be supported if the transport is properly implemented. For ICQ, you would simply treat the ICQ UIN as if it were a screen name; for mac.com, you should be able to include the @mac.com (it might show up as %mac.com) in the screen name. if not mistaken they also have deal with skype. hope to see more integration too. if not mistaken they also have deal with skype. hope to see more integration soon. This probably explains why Google did not invest heavily in GTalk client programs. Rather than making another beautiful IM competing with other IM program at the same level, Google focus more on interoperability, then Goggle can use its muscle of aggregating data and searching. Been doing this for a while via Jabber. Based on the hits I keep getting to this old article, so are other. was that an extenstion or its different for trusted testers ! Ionut, what about better screenshots with editing to tweak the names to fake ones instead of blur? No extension, from what I know. I'm not the one who edited the screenshots, but I think they reveal more than enough. Is this only going to be in the embedded e-mail version? Or will it be for the desktop client as well? Also, when is that new version of gmail that appears in the screen shot going to be available? Who has access to these new features in Gmail? Is it only the most trusted of testers? They seem to have implemented the vCard Extensions for Instant Messaging and IM gateways apparently. Hopefully, they'll support SIP soon, perhaps with GrandCentral. it's about time. AND they better get gtalk for the mac. Adium is cool but I want gtalk! I dont like yahoo mssg,too many flashy adds. So where's the voice and video interop? IM isn't just chat any more. Now you can control wether to have the emoticons played automatically or not from Settings > Chats. Please add AIM to the Gtalk desktop application. If you do, I won't even use the other IM providers. When is this going to be available. I'm downloading Gtalk, but don't have this new feature! Unfortunately the feature is available only in Gmail, not in the Google Talk desktop client or in the gadget. "I really hope that they are planning on dressing up gTalk desktop. I have no interest in gTalk gadget or in using it in the inbox in Gmail. Don't hold your breath. Its moving to the web whether you like it or not.